Have you ever heard anybody rappin’ on the moon? It sounds really muffled, so the story goes. Of course, the real story involves the Blue Note label’s policy circa 1969. 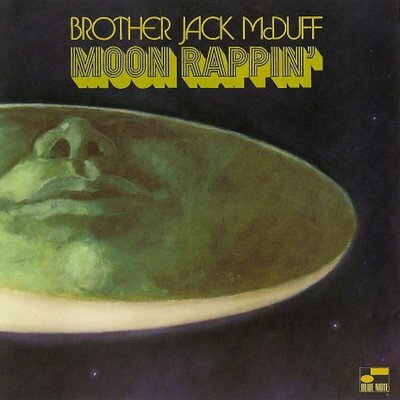 “Brother” Jack McDuff’s Moon Rappin’ is just a wacky title of a wacky concept album. Included in the gatefold sleeve is a wacky poem about Brother Jack and Brother Moon. Although the album luckily doesn’t include equally wacky entertainment by McDuff, it nevertheless mostly consists of a travesty of McDuff’s typically earthy and churchy soul jazz style. That style is ostracised in favour of a series of mildly disappointing compositions characterised by a superficial sound too ‘rock’ for my taste. This kind of production might’ve satisfied a hip crowd, but because of that production the 4/4 time sections in between funky bookends sound rather clumsy. One almost feels sorry for drummer Joe Dukes, whose red hot, dynamic style blended so well with McDuff on mid-sixties recordings such as Hot Barbecue and Live!. I have to admit the melody of the opening funk-blues tune Flat Backin’ easily nestled in my mind after a hide-out in my record cabinet for about seventeen years and continued to stay there for days on end. It is affective. McDuff succeeds to put pepper into his solo but lacks stimulation from his group. Punches of wah-wah guitar that would do well on a blaxploitation movie soundtrack fit right into the picture. But the only real highlight on Moon Rappin’, really, is the middle section of Oblighetto, wherein Joe Dukes finally lays down an exciting groove that seduces McDuff and group to partake in brittle and fiery exercises. Curiously, these sections start after a recurring series of Lorelei-like female vocal parts. After the departure of Blue Note founder Alfred Lion, co-founder Francis Wolff produced a string of both artistically and commercially succesful groove-oriented albums in the late sixties and around 1970 by, among others, Lonnie Smith, Grant Green, Reuben Wilson and Lou Donaldson. Smith’s Move Your Hand, Green’s Green Is Beautiful, Reuben Wilson’s Love Bug and Lou Donaldson’s Midnight Creeper are cases in point. Moon Rappin’ doesn’t belong to that league of expert jazz funk recordings. “Brother” Jack McDuff strayed too far from his r&b and church grounds to deliver a really satisfying album in this genre.